The New York Daily News ran this headline in its Jan. 23, 2010, issue above a Reuters article about what Pope Benedict XVI said in his message for the Vatican’s annual World Communications Day. Other news outlets around the world ran the same story. A growing number of priests in the archdiocese are following the pope’s lead, and are effectively bringing people to Christ through the Internet and other emerging communications technologies. One of the main reasons some of these priests are blogging, using social networking sites such as Facebook, and sending text messages on their cell phones is because it is the best way to keep in contact with youths and young adults. If that is true for a typical parish priest like Father Augenstein, it is even more so for Father Rick Nagel who, as the archdiocesan director of young adult and college campus ministry, ministers solely to young adults. But while he is adept at using the emerging technologies to keep in touch with them, he sees what he is doing as having ancient roots. Although Father Nagel will meet youths and young adults in the digital world, he and priests like Father Augenstein don’t want to leave them there. Father Nagel is very deliberate about using digital media as only a starting place for strengthening the faith of young adults. “It’s an entry-level place for relationships for everybody,” he said. “But it must go beyond the virtual world. At the same time, Father Nagel recognizes some of the dangers of ministering online. Users of Facebook connect to one another by becoming “friends” on the site. Father Nagel has more than 900 such friends, but is discerning when someone new asks to become his friend. He also said that staff members in the archdiocesan Office of Catholic Education are in the process of drafting guidelines for those who minister to and with youths and young adults about how to use social networking sites appropriately, and how to pass on such principles to young people. There is also the simple danger of dedicating time to ministering in the virtual world that could be used for ministering in the real world—face to face. Father Nagel hasn’t used the popular micro-blogging site Twitter simply because he has found that the young adults he ministers to don’t use the site. At the same time, Father Augenstein says posting the text of his weekend homilies on his blog, “Perpetual Priest,” takes about two minutes. But that small amount of time broadens his ministry. 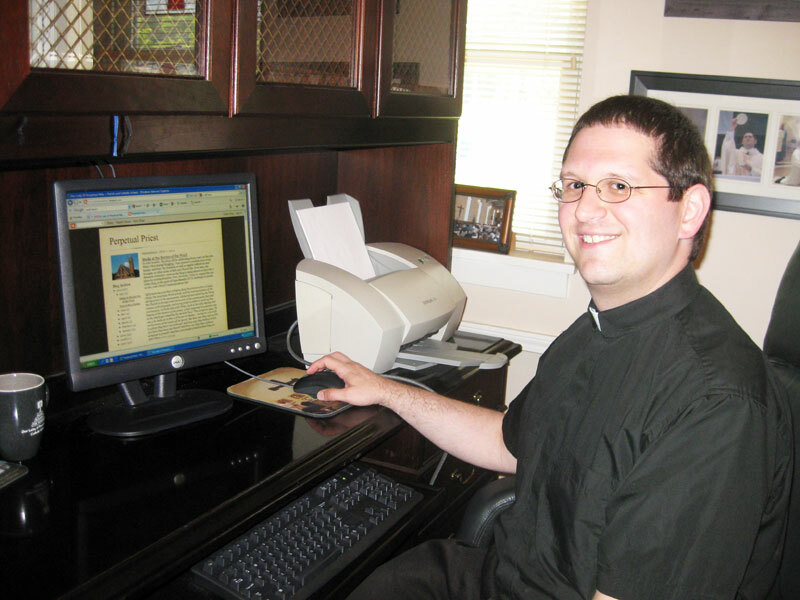 At 24, seminarian Michael Keucher, a member of St. Charles Borromeo Parish in Bloomington, has grown up with the Internet being a constant presence in the prevailing culture, and sees ways of using blogs in a time-efficient manner. While priests and future priests who blog, use Facebook and text message seek to steer clear of the dangers on the Internet, they still recognize it as an effective means for evangelization. “There’s a great deal of power in the Internet,” Keucher said. “And I think that, oftentimes, that power is used for evil. There’s certainly a bunch of trash out there. Father John Hollowell started blogging in earnest after hearing about the pope’s call to priests to use the Internet earlier this year. On his blog, which is titled “On This Rock,” he posts videos of homilies that he delivers on weekends at St. Malachy Parish in Brownsburg, where he is a sacramental minister. Father Augenstein agrees, seeing his use of the Internet as a way to draw people to Christ. Want to see how some priests and a seminarian are evangelizing online? For Father Eric Augenstein’s blog, log on to http://perpetualpriest.blogspot.com. For Father John Hollowell’s blog, log on to http://on-this-rock.blogspot.com. For Father Rick Nagel’s blog, log on to http://indycatholic.blogspot.com. 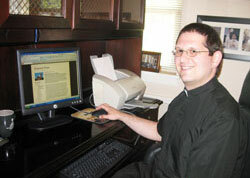 To read seminarian Michael Keucher’s blog, log on to http://tallseminarian.blogspot.com.